The pattern is by Bronwyn Hayes and was in an Australian magazine over 3 issues. It was a huge quilt to take on after only ever having made a table runner before this. The embroidery took the longest but it was very enjoyable to sit and stitch in the evenings after the kids had gone to bed. It includes embroidered blocks, raw edge applique and needle turn applique. 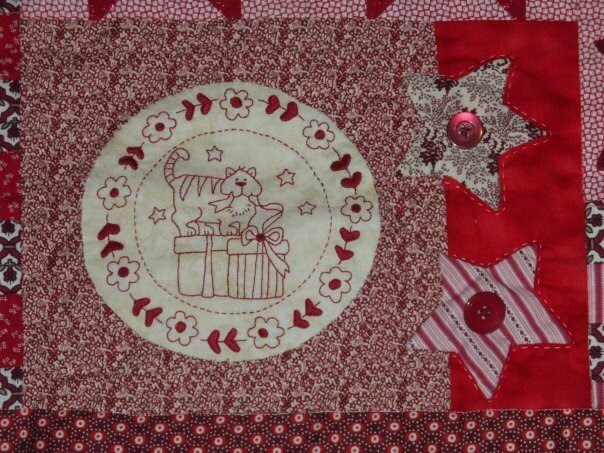 It is hand quilted around the various stars, applique's and embroidered blocks. It includes the names of the members of my family and the family names of those nearest and dearest. fascinatingly wonderful quilt!! i love it--and love the family memory of it. Your embroidery is gorgeous and the quilt is pretty. This is lovely and you have done a wonderful job. Not only is the embroidery well done, but so is your appliqué. Congrats on a terrific quilt! I positively love the embroidery. It's beautiful, and I agree, you did a fantastic job for your first big quilt project. Stunning! Wow! Your first quilt? I would definitely see this handed down throughout your family...the only concern would be is who would be the one to have it? All your future grandchildren would want it! As we are manufacturer we can make product base on your specification. We are looking for wholesaler or retailer. with affordable price in classic or modern hand made style. That's a gorgeous quilt! Thanks so much for sharing, and thanks for the lovely comment you left on my blog. I was browsing around your blog and you are very talented!